The Montessori Institute of Advanced Studies believes that each individual pursues his/her own growth within the limits of social responsibility, as stated in Maria Montessori’s Philosophy of Education. Our Teacher-Training Program offers an opportunity to verify what gifts reside inside the student-teachers for helping children in their self-learning. Most important of these qualities that we intend to nourish is an intuitive quality of attention. In its presence we will experience openness to the child’s heart and receive its trust in return. Create teachers as “scientific pedagogues” who see the prepared environment as a dynamic system that follows the child in the pursuit of his/her intellectual and moral needs. The Montessori Institute of Advanced Studies conducts a Montessori Teacher Preparation program for Early Childhood (2 – 6 years). Maria Montessori pioneered in this field in Italy in the early 1900s, and established solid foundations. Her methods were derived from careful observation of children. Each child, she noticed, carries inside a deep desire to learn and to bring forth its special gifts. She was able to show that under favorable conditions, with sensitive teachers and carefully designed material in proper arrangement, this inner sense of order and intelligence in children would blossom. The Institute’s courses can be credited towards a B.A. in Human Development at California State University, Hayward. The students receive up to twelve units for the courses from the University through the Division of Continuing and International Education. The Catalog/Student Handbook is a guide for finding answers to many questions you may have. We are looking forward to meeting with you to make sure that you progress satisfactorily. Our training program requires on your side commitment to learning and Willingness to risk personal growth. On our side, our faculty will nurture your gifts as a child-centered teacher. We welcome you in our program and we look forward to interact with you around the themes of this truly sensitive and creative approach to children in the early years of their lives. Our Teacher-Training program offers an opportunity to verify what gifts for helping children in their self-learning reside inside the student. We intend to nourish an intuitive quality of attention. In its presence we will experience openness to the child’s heart and receive its trust in return. We believe that our mission needs to submit itself to the living reality of each child that can never be generalized. We encourage our students to aspire to become “scientific pedagogues” in their classrooms so they may contribute to the vitality and open-endedness of Montessori principles through tests in contemporary conditions. Our training emphasizes observation of the child as a tool to create an appropriate educational environment. In this attentive openness we often discover entirely new dimensions. We believe education involves the whole person and manifests itself in physical, emotional, social, intellectual, and spiritual growth. We believe that most effective learning takes place in an environment of mutual respect and cooperation. We believe that academic excellence is possible when the child’s gifts are recognized, encouraged, and developed. To provide students with deep grounding in Dr. Montessori’s philosophical principles, their historical significance, and their relationship to contemporary educational theories and practices in Early Childhood Education. To show students how knowledge of child development is implemented in the preparation of a learning environment for children. To prepare students for designing, presenting, and evaluating activities in the core curriculum areas of the Montessori Early Childhood classroom in awareness of children’s developmental, socio-cultural and cognitive needs. These areas include Everyday Living Skills, Sensory-Motor Learning, Montessori Mathematics, Language Arts, Social Studies and Sciences, Art, Music and Movement, and Outdoors Environment. To groom students to be “scientific pedagogues” by learning to observe and record natural phenomena of children’s growth, to match needs with materials and resources, and to prepare professional reports of their progress. To prepare students gradually to take responsibility of the whole program by working in a Montessori school under the supervision of a Master Teacher. The students will receive teaching/learning experiences in providing opportunities for the children in problem-solving, decision-making, and taking responsibility. The students will also learn about State and School regulations. The students will learn to articulate these experiences through a year-long Synthesis Project that will be presented by them at the end of the Practicum phase. To awaken in the students a sense of responsibility for creating a peaceful community with all the adults they will be working with as teachers. The Montessori Institute of Advanced Studies is accredited by the State of California, Bureau of Private Postsecondary and Vocational Education. The program is accredited by MACTE and it is affiliated with the American Montessori Society. The program takes two years to complete and become a qualified Montessori teacher of children between the ages of 2 and 6 years. The first year is comprised of academic courses and the second year is a practicum year. The classes are held at the Montessori School at Five Canyons, 22781 Canyon Court, Castro Valley, CA. 94552, phone (510) 581-3729. The Practicum phase includes Internship under a Master Teacher in an AMS-affiliated Montessori school, workshops, Internship Seminars, ten observations and a Synthesis Project. 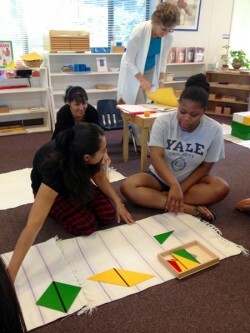 Students who complete the coursework and the practicum and who meet the State of California Requirements are granted a graduation certificate that qualifies them to teach in early childhood Montessori classrooms as master teachers. The full certification is granted only to candidates who hold a baccalaureate degree. Associate certification is granted to candidates who do not hold such a degree. Units/Credits: 15 units are offered during the Academic phase. Twelve of these units can be transferred to the California State University, Hayward (CSUH) after successful completion of the Teacher-Training (optional). Degrees: These 12 units can be used toward the Bachelor’s Degree in Human Development. Certification: The program is affiliated with the AMS and is accredited by MACTE. Upon successful completion of the Teacher-Training Program the Credential Certificate will be requested from the AMS. The Academic phase takes place during the school year over a period of one year. In order to enter the Practicum phase the student must complete the Academic phase first. The Practicum phase also lasts a school year and must be completed within three years after completing the Academic phase. The Academic phase consists of five courses or 180 hours of instructional time. The Practicum phase includes 6 workshops (48 hours), 6 seminars (18 hours), and 540 hours of interning. Overall there are 786 hours of academic and practical studies. The student is required to intern in an AMS-affiliated preschool under supervision of a qualified Montessori Headteacher. The learning also includes 10 systematic observations, attendance in 6 Seminars and 6 Workshops, and a Synthesis project. Upon successful completion of the Practicum and all requirements the Institute will issue a certificate of graduation. The American Montessori Society will grant upon request their Certificate (full certification for students who hold a Baccalaureate degree or associate certification for others). The candidate for the Early Childhood (Preprimary) Credential must hold as a minimum a bachelor degree from an accredited institution. An Associate Early Childhood (preprimary) Credential may be given to students who do not have a four-year college degree. Candidates for the associate credential must complete all requirements for the program and may not represent themselves as holding an Early Childhood Credential. Holders of an Associate Credential are strongly encouraged to submit proof that they are in process toward attaining their four-year college degree. Associate-certified teachers are eligible for the full Early Childhood Credential when the four-year college degree requirements have been completed. Documentation required for this is submission of an official college transcript of an accredited college or university to the certifying agency. Our institution is approved by the California Bureau for Private Post-Secondary Education (BPPE). For more information about the BPPE, please visit http://bppe.ca.gov. Our annual report can be found here.